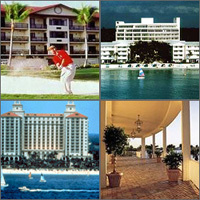 Compare discounts for Hotels Resorts in Naples, Florida! Naples is considered Florida's most sophisticated small city and some would argue this is true not only for Florida but for the entire country. With over 35 golf courses, Naples is a major golfing location it is also a perfect vacation spot for Tennis lovers. Naples' waterfront area known as 'Tin City' and to the Fifth Avenue Shopping district have 'Class' usually found only in much bigger (and less peaceful) places. Note: Lists are not identical. Different sites offer different accommodation options for Naples. The Naples Grande Resort Club is Florida's only luxury resort offering guests the flexibility to relax enjoy world-class facilities and explore nature in a setting filled with marine life exotic birds wildlife preserves and pristine beaches. With its tropical backdrop The Registry Resorts interior is elegantly appointed in a refined and comfortable setting. Enjoy powder white sand at this beachfront location at the LaPlaya Beach and Golf Resort that has recently undergone a $47 million transformation. The Charter Club Resort on Naples Bay is located in the city's historic district, a short walk or bicycle ride from the beaches, the historic Naples Pier, waterside restaurants, tennis courts, art galleries and exclusive shopping. The Edgewater Beach Hotel is an intimate, all-suite boutique hotel located on the sandy white beaches of the Gulf of Mexico in Naples, Florida. The intimate and elegant Hilton Naples and Towers opened in February 2000. The hotel features 191 beautifully appointed guest rooms and 13 suites, a concierge executive level, 9,079 square feet of flexible function space, fitness center, oversized heated swimming pool, business center, gift shop and the famous Don Shula's Steak House which is ranked among the top ten Steak Houses in America since 1991. The newly renovated Naples Beach Hotel and Golf Club is located on 125 acres of lush landscape directly on the Gulf of Mexico where the warm Gulf waters meet the white sands of the beautiful Naples beach. The Inn on Fifth is located in the heart of old Naples, 6 blocks from warm waters of the Gulf of Mexico and near antique shops, gourmet restaurants, sidewalk cafes and art galleries. Bask in the elegance of a Mediterranean-style luxury hotel on a private lake in prestigious Pelican Bay. The Trianon Old Naples is a first class luxury-style hotel located in the residential neighborhood of Old Naples. Guests can walk to the waterfront area known as 'Tin City' and to the Fifth Avenue Shopping district. Grandly luxurious with its twin turrets, The Ritz-Carlton Naples is reminiscent of a sun-drenched Mediterranean villa. The DoubleTree Guest Suites Naples is a full-service, all-suite hotel surrounded by palm trees, overlooking the Cocohatchee River and Wildlife Preserve, two miles from beautiful Gulf Coast beaches and minutes from shopping and attractions. The Ritz-Carlton Golf Resort Naples is located on the edge of a famed golf course, three miles from the oceanfront. Staybridge Suites is a first class hotel located in beautiful Naples, Florida only one mile from the Gulf of Mexico and a 45 minute ride from Southwest Florida International Airport. The Inn of Naples at Park Shore is located within minutes of the gulf beaches, upscale shops 5th avenue, waterside shops, golf, tennis and historic district. Residence Inn by Marriott is designed to make you feel at home for a day, a week, a month or more. .